A detailed policing operation was implemented to safeguard everyone attending the festival this year, as well as the local Isle of Wight community, in what is one of the busiest weeks of the year for the island. This year saw a significant increase in the number of people attending the event, yet crime still remained comparatively low, with a noticeable decrease in the number of violent offences. Initial figures suggest that the number of overall offences reported to police during the four-day Isle of Wight Festival 2018 were 90. Last year 41 crimes were reported to police, and this compares to 85 the previous year (2016). Further to this, 15 arrests were made this year. Drug offences remained low, and a number of significant arrests were made to inhibit the availability of drugs on site. In addition, drug seizures and the use of amnesty bins proved a success with £8,351 worth of drugs being removed from the site, compared to £2,202 in 2017. Officers and staff from across the force have worked together from the planning stages and throughout the festival, to keep people safe and out of harm’s way. Uniformed officers have maintained a visible presence patrolling the outskirts of the festival, engaging with the public to provide safety messages and reassurance, as well as to tackle crime. Festivalgoers were also encouraged to follow @FestivalCop on twitter to receive crime prevention advice and to keep up to date with what our officers were doing at the festival site. 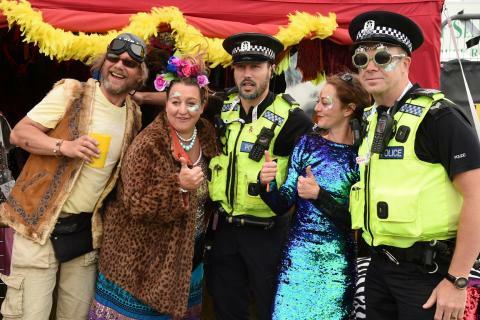 Isle of Wight Festival policing commander Superintendent Simon Dodds said: "Isle of Wight Festival has established itself as a relaxed and family-friendly event over decades of operating, and continues to do so as it moves into its 50th year. “We are grateful to the general public and Festivalgoers for making it so. We do of course recognise that there has been an increase in overall crime reports this year. “This is largely down to an increase of reported thefts from tents on the first night. However, police and site security were quick to respond to these reports and subsequently two suspects were arrested. We are confident that this proactive joint work lead to the prevention of further offending of this type for the remainder of the event. “Reports of violent offences were also down from the previous year, which we are pleased to see.